Update: When I wrote this, I was down 12 pounds in a month. Now, as of 5-1/2 months, I’m down 65 pounds. I know it’s common for tech companies to proclaim all their products world-changing. HBO’s Silicon Valley has a really funny parody of this from an episode about TechCrunch Disrupt, with startup CEOs claiming every little product as life-changing. But in sitting down to write about the Apple Watch after wearing it on my wrist for a month, only one theme is strong on my mind: it’s changing my life. I’m remaking my health habits, I’m losing weight, and I’m more focused and present in everyday life. It’s been well worth the $450 or so in long-saved gift cards I spent on the Sport model. Before I get into that, a couple caveats. First, as they say in Cluetrain, your mileage may vary. Apple Watch isn’t for everyone, and though I think their marketing campaign (“it’s our most personal device ever”) is a nebulous message for people who’ve never worn one – WHAT DOES THAT EVEN MEAN?? – I see their point. It’s interactive and customizable, but how each person does those things will be different. Those differences might be enough to not equal a rationale for purchase. Second, yes, I understand that people make choices to have good habits or behaviors, that devices don’t make choices for them. But it’s more complex than that. We’ll get to it. tl;dr version: the Watch might not be for you, but I encourage you to not base it on a few reviews. Talk to people about what they do with it, people with lots of different use cases. It might fit your life, it might not. I don’t consider it a must-have device, but for certain types of people with certain needs, it’s incredible. OK, on to the review …. First we’ll start with what it’s like and hit on some of the plusses and minuses. This won’t be all-encompassing. If you’d like to read a couple thoughtful takes on the Watch, I’d recommend Jim Dalrymple’s review and this by Walt Mossberg. Also, this one from The Oatmeal is good, and funny! It’s less about what they have to say and more that they wore it for a long time, and that is much better than some of the reviews where they tested it for a week or a weekend. The Watch is about habits, not individual experiences, and you need time to assess that. It’s comfy: It fits nicely on the wrist, isn’t too big or small and it isn’t heavy. The watch comes in two sizes. I’ve assumed the smaller size is more for women, who on average tend to be smaller. I suppose if you’re around 6 feet tall or so, that’s when you start thinking about the big one. The small version looked ridiculous on my arm. I like some of the more expensive bands, but the black rubber band has been strong, durable, and comfortable. App notifications: Just as with a phone, you can have all your apps notify you of things whenever something new happens. Email and messages are obvious, but like your phone you can enable everything. Tweet replies, Facebook likes, plans made on TripIt, breaking news on NYT, etc. Enabling everything is a terrible idea. Every review that says keep it minimal is right, because every notification means a chirp and a slight buzz-tap on your wrist that will overwhelm you if you don’t regain control. What I did first is turn off all notifications except email and text messages. What I discovered quickly is most email alerts didn’t matter, so I used my iPhone VIP feature to only alert me to messages from friends and family. I maybe get an email alert or two per day. It’s perfect. Since then I’ve turned on news alerts from the NYT app and a few things, but it’s better to enable more once you’ve worn it a bit. 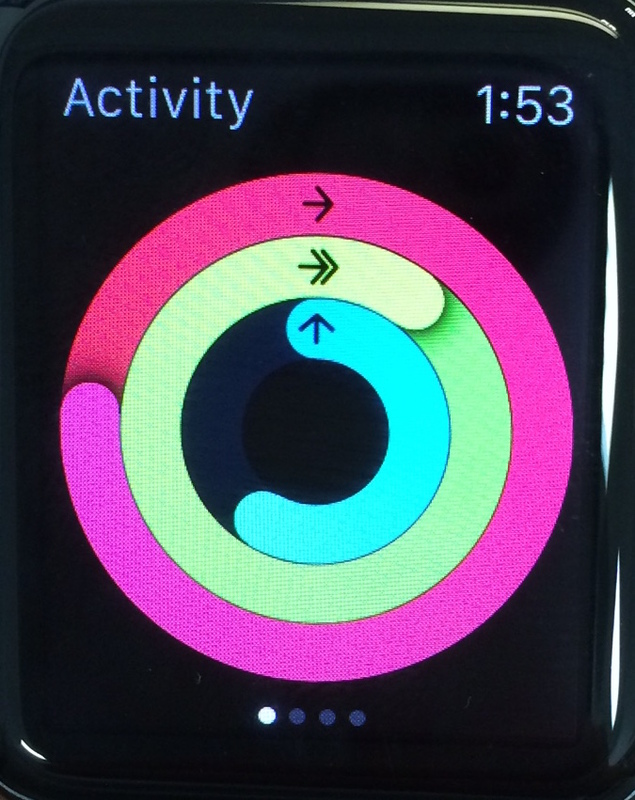 Apple Watch’s activity rings. Red is for calories burned from moving around, green is for workout time (moving with an accelerated heart rate for extended time) and blue is for standing and moving around for at least a minute during a given hour. Fitness notifications: The reason you keep other notifications to a minimum is because you get different fitness notifications throughout the day, and that just adds to the pile. Visualized as the “three rings”, it is available in a smaller form on your watch home screen, and you can tap it to bring it up to a bigger size such as the picture at the right. You burn something like 2800 calories a day from just being a human, but what about the extras? The red ring measures those extras (for reference, sedentary folks burn about 300-500 a day). You can adjust the red ring to fit goals and push yourself. I started about 250 and within two weeks I was at 350 a day; in fact the Watch will suggest increasing if you’re consistently exceeding targets. The green ring looks at exercise time. The default is to do 30 minutes a day. You don’t have to hit any buttons; Watch knows when you’re elevating your heart rate for extended periods and will add minutes as you go. I’ve learned that going for a slow walk won’t get me exercise credit; I need to do a moderate to brisk pace (3-4 mph). Finally, the inner blue ring gives you credit for standing and moving around for at least a minute per hour. The goal is you do this 12 times a day. I’ve found I generally can get about 8 without thinking about it, but on the others I need some prodding. If you’re in the 50th minute of a given hour and haven’t gotten credit for that hour, Watch buzz-taps you to stand and move around for a minute. It’s helpful. If you get a Watch, you’ll obsess over these rings. The gamification and data visualization are simple and easy to understand. I find myself pushing myself to hit targets. You get little badges for different things, such as new calorie records or doubling your calorie goal for the day. It’s great and useful, but more on that later. Battery life: It’s great, way better than how Apple has sold it. Don’t worry about it. I once went through two full days without charging it even though I did hour-long workouts both days (although, to be fair, I used a third-party app instead of the Watch workout app; the latter measures your heart rate every 10 seconds which, I presume, drains the battery more). On a typical day, I have 45% charge left by bed time. Minimal notifications probably play a role, but really if you’re draining your battery you’re on your watch too much, and so you’re using it wrong. The Watch is built for quick information and glanceability; view those photos or play those games on your phone or iPad. Apple Pay: It’s beautiful. I have an iPhone 5s so I haven’t been able to use it, but Watch will let you use Apple Pay on a 5 model. I’ve used it at a lot of places I frequent and it’s smooth. I’m at the point I’d prefer to shop at places that don’t make me take out my wallet. Missing stuff: I wish they had integrated the music player with the Workouts app. I have to back out of one to go to the other, and it’s a pain. I wish it had a “daytime” mode for when you’re outdoors in bright light, using a white screen with dark letters. I realize it means battery loss, but if it was easy to turn on for short periods it’d be fine. Pairing with an iPhone is great, but having working wifi built-in would be nice. No iPhone is bad: I experienced this one inadvertently. Last weekend my iPhone bricked on me, leaving me without a phone for two days. Watch was a way worse experience. It uses the phone for app functionality, for starters, and it has no Internet if it’s not paired to a phone by Bluetooth. It will tell you the time and track some of your three rings (albeit less accurately) but that’s about it. No weather updates, no integrated calendar, etc. It’s a terrible experience. You can’t pair this with an Android phone, so it’s iPhone or nothing. If you don’t own an iPhone, you will not like Apple Watch. I’ve lost 12 pounds in the five weeks I’ve had Apple Watch (update: I’m down 65 pounds in 5.5 months as of Nov. 16). I’m going to let that sentence sit alone. For those who know me in real life, it’s a tremendous thing. The day I received my Watch I was at 271.1 pounds, and nearly six months later I’m at 206. I have not taken care of myself since graduate school began and have been slowly adding pounds. The first part of 2015 saw me adding at an accelerated rate. I’ve known I need to get healthy for a while and had been thinking about a fitness tracker. When I saw Apple Watch’s features, I bought on the first day. 1. The rings. They really are a help. They make me more mindful in the moment of how I’m doing with the day’s exercise and standing goals. Those subtle taps on the wrist when I haven’t stood in a while, or to update me on calorie burn – those are huge for forming new habits. When you’ve lived a certain way for a while, you aren’t as aware of your own habits. Watch has helped me be more mindful. For someone who hasn’t been mindful, who doesn’t have those habits, this is a breakthrough. 2. Making me think about fitness. Beyond the rings, I found myself immediately interested in knowing more. Was burning 500 calories in a day good? What if I walked? What would I need to burn to lose weight? I found myself downloading calorie trackers, then fitness apps, to my phone to track what I eat and do, all after Watch arrived. I bought a scale to weigh food and (for the first time in my life) really look at portion sizes and allotments among the food groups. I’ve been walking 3-4 days a week. I’ve discovered I eat way, way, way too much sodium, for example. Again, this is huge. I haven’t lived like this. It took me a bit to calibrate my eating to the recommended calories (which are always off) but once I did I’ve been going strong. I feel way more in tune with my body and vitals. 3. HealthKit comes alive. The app was squirreled away in the Useless folder on my iPhone, but with Watch tracking calories and gathering vitals that feeds to HealthKit, and thus all the health apps I’ve tried, I have a good snapshot of my health in a day/week/month window. Your mileage may vary. I’m the kind of person who does well with goals and data. Feed this to me and it helps me figure out what I’m doing right or wrong, and then I can make adjustments. I know a bit about motivations from my psych classes in grad school. We are motivated by different things, some internal and some external (such as rewards). The ultimate goal in motivations research is to figure out how it spurs action, and in part how that forms habits. Everything I’ve read seems to indicate it takes about 8-12 weeks of continuous use to form habits. Watch is designed to help create habits, from offering extrinsic rewards to the little buzz-tap prods on your wrist to remind you to move around and burn calories in case you’re forgetting amidst a busy day. It’s not that I’m lazy; I’m busy, and sometimes my choices are more about prioritizing. I feel better since I first put Watch on. Not great, and not nearly as well as I should. But I feel a lot better, have more energy than I did, and it’s had a positive effect on my mental state. One other side benefit. I’m pulling out my phone less than I used to. Watch has helped me whittle notifications down to the bare essentials, and I’ve found I can focus on my family or what I’m working on better by just leaving the phone in the bag. A lot of us complain how we’re addicted to our phones. This is going to sound crazy, but buying a new gadget helped me break poor use habits on another gadget. The cynical person could mock me for needing a gadget to solve my gadget addiction. I’m weak if I can’t muster that from within. Fair enough. But less time on the phone is less time on the phone, so why argue with how I got there? Everyone’s reasons are different. Mine were about the fitness tracker and slowing the flow of information coming at me. It’s been everything I hoped for and has been well worth the cost. Your reasons my differ. You might want other things from it. This isn’t a gadget you should be on all day, like your phone or iPad. If you want that, I don’t think this thing is for you, but I could be wrong. I wanted a fitness tracker and Watch has been great for that. I know the FitBit and similar devices run at about half the cost, although I’ll say they don’t do things like prod you to get up and walk. Throw in the integrated iOS features and for me it’s been worth the extra $200 or so. I would suggest, though, that unless you’re loaded you should start with the $349-$399 Sport model. I went with the space gray aluminum with the black band; I wanted to know I was going to use this thing before I started thinking about accessories. I also figured that if I wanted to upgrade to a newer version or the nicer stainless steel models, I’d be able to justify it once I knew I used it. I can tell you most of the early reviews were way off. They don’t match my experience at all. And why should they? They’re reviewing Watch as a gadget, not as a personal companion to help you live better. They were using it for a week or weekend as a loaner, not integrating it into their lives. They weren’t thinking about habit. I’m more mindful of how I move, what I eat, and my activity levels because of Watch. It isn’t making me lose weight or eat healthier, but it’s helped spur me in that direction in multiple ways. In that sense, it’s been well worth the cost.